$150 or more, you will receive a $10 gift card back! $200 or more, you will receive a $20 gift card back! $250 or more, you will receive a $30 gift card back! *The gift card you receive back is to Sego Lily Spa. You may purchase gift cards in any increment over $100 to be eligible. Valid on in-store purchases only. One offer per person. $100 or more, you will receive a $10 gift card back! $150 or more, you will receive a $20 gift card back! $200 or more, you will receive a $30 gift card back! ** Please Note ** This is a one-time use promo code but you can purchase as many gift cards with this code as you’d like! To receive this offer you must be logged into our system with your username and password, in other words, don’t check out as a guest! https://segolilyspa.com/wp-content/uploads/2018/11/best-black-friday-ever-insta.gif 900 900 Jake Garn https://segolilyspa.com/wp-content/uploads/2018/05/Sego-Lily-Logo-2018-final-white.png Jake Garn2018-11-15 13:44:312018-11-21 12:30:04Online Gift Card Promotion - Black Friday Only! https://segolilyspa.com/wp-content/uploads/2018/05/Sego-Lily-Logo-2018-final-white.png 0 0 Jake Garn https://segolilyspa.com/wp-content/uploads/2018/05/Sego-Lily-Logo-2018-final-white.png Jake Garn2017-10-23 23:08:112017-10-23 23:08:11Sego Lily Spa is 2017 KSL Voter's Choice Winner! This Mother’s Day there are two ways to win a fabulous spa package. And you could win a fabulous spa package! 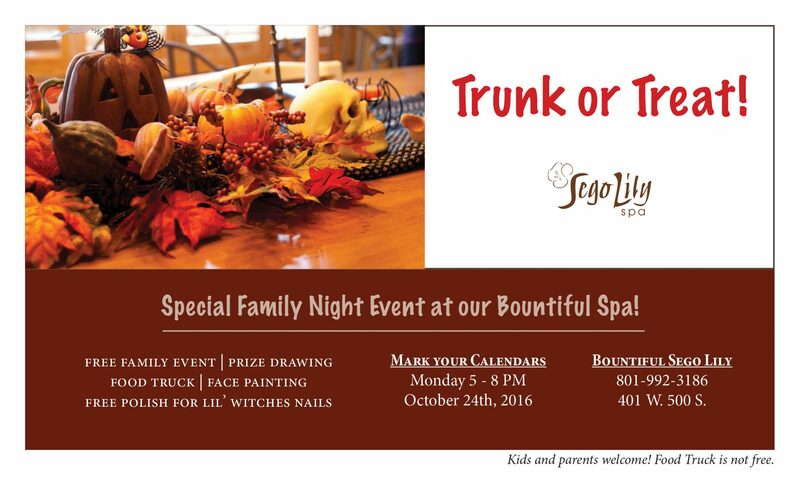 One Grand Prize winner will be chosen for each Sego Lily Spa location. Multiple winners will be chosen for our other prize packages. Prizes may be claimed by yourself or gifted to anyone you choose. Winners will be posted on our Facebook and Instagram Pages on Saturday May 10, 2014. Promotion is valid on in-store gift card purchases only. Spa Retreat Giveaway on Facebook! Have you visited the Sego Lily Spa Facebook page? If not click here and share a story with us and you could win a Spa Retreat for the mother in your life! Find this post and enter for free! Join us in appreciating the Mother figures in your life by sharing your story with us! Between now and Saturday, May 10th telling why the special woman in your life deserves a day at the spa. Accompany your story with pictures and tag us if you’d like. We’d love to hear anything! Funny, touching, or just plain awesome! The winner will be chosen by YOU, our Facebook followers. Whoever receives the most “likes” on their comment by May 10, 2014 will win a customized spa retreat! Make sure to tell all your friends and family about our contest so you can get tons of votes. https://segolilyspa.com/wp-content/uploads/2018/05/Sego-Lily-Logo-2018-final-white.png 0 0 manager https://segolilyspa.com/wp-content/uploads/2018/05/Sego-Lily-Logo-2018-final-white.png manager2014-04-11 15:24:042014-04-11 15:24:04To Mom - with love! Sego Lily Spa is giving away FREE 60 minute Spa Services on Friday, November 29th! Both spa locations will be opening the doors at 8am (one hour earlier than normal) for this special, once a year offer. 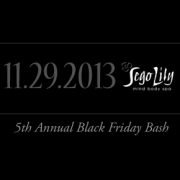 Give a Sego Lily Gift Card to your friends, family or co-workers & you can enjoy a FREE massage for yourself! Also enjoy 20% off ALL retail products, all day for anyone and everyone! *Free & discounted services must be received before Christmas Day, 2013. Only ONE free or discounted treatment PER PERSON and/or per qualifying purchase (so bring lots of friends!) MUST BE PRESENT to receive the offer. No Phone orders or online orders will be accepted. To qualify, gift card(s) may be purchased in any denomination & in any quantity as long as the total value equals or exceeds $100. Choose any 60 minute service from the menu. Management reserves the right to make changes to this promotion at any time, without notice. Though we have no plans on doing so!